If you have ever worked with VMWare’s vSphere, I’m sure there has come a time that you needed to modify or remove Windows VM Disk. Sure, it’s a simple enough task, but what if you have multiple disks that are the same size? How can you correctly identify the virtual disk in vSphere? Luckily, it is quite easy to identify a virtual disk in a Windows VM. On your Windows VM, open Server Manager. In Server Manager, Expand Storage and click on Disk Management. Right Click on a Disk and click Properties (Note: Make sure you right click on the left side where it says Disk #, don’t right-click on the right side where it has the partition). On the General Tab, locate the Bus # and Target Id and record the values for each disk. In vSphere, open the properties of your virtual machine. If you select a virtual disk, the SCSI or IDE Controller and ID is displayed under Virtual Device Node. Using this information, you can match it to the Windows Disk. The SCSI/IDE Controller # will match the Bus # and the SCSI/IDE ID will match the Target Id. 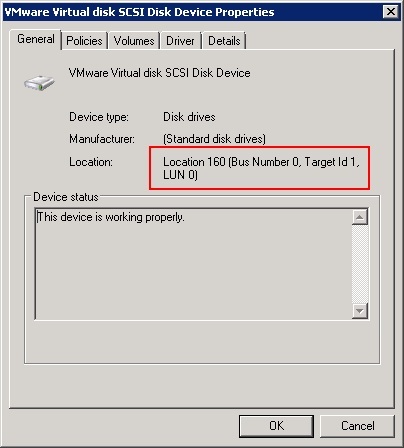 Ex: Bus 0, Target Id 1 in Windows matches SCSI(0:1) in vSphere.